I remember having to read excerpts from Thor Heyerdahl’s book Kon-Tiki: Across the Pacific in a Raft in 9th grade. We may have even watched some or all of the documentary that used footage shot by the raft’s crew. So when I saw that a film of this amazing story had been made, I was interested in revisiting the story of Thor Heyerdahl. 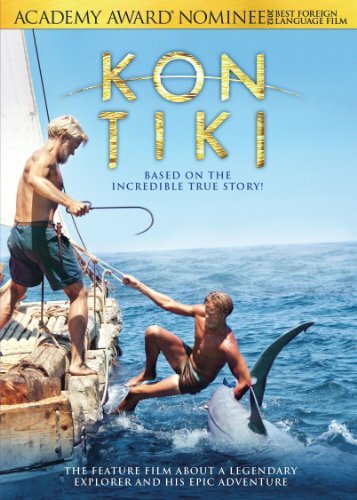 One of the most refreshing aspects of this film is that it is not only a compelling true story, but that it is one of the rare instances of a film that can easily be enjoyed by all members of the family from young kids all the way up to grandparents that remember when Heyerdahl made his trip in 1947. Despite being a Norwegian film the majority of the dialogue is in English. You won’t need to worry about poor dubbing, or subtitles. The film begins with Heyerdahl’s quest to fund his expedition to prove his theory that the inhabitants of Polynesia originated from South America, and not Asia as was commonly accepted at the time. Once Heyerdahl and his crew hit the open ocean we are there with them on a balsa wood raft facing an assortment of challenges and obstacles. The film clicks along through its 118 minute run-time faster than you expect. Set primarily in the South Pacific, this is the perfect film to brighten up a rainy spring afternoon. Once you’ve finished, I also recommend watching the 1950 documentary for a full Kon-Tiki experience.